Purpose: Promote body awareness, motor skills and listening skills. Activity: This can be played with one player or a group of children. The adult faces the group. Explain the directions of the game. The adult is going to ask the children to move certain body parts based on questions. The children are not to answer the questions. They should move the body part that is the answer to the question. Question: What body part waves hello? Answer: Children wave hands in air. Here is a list of several questions and answers or make up your own. See what questions the children can come up with. Q: What body part makes funny faces? Q: What body part wears socks? Q: What body part uses crayons? Q: What body part smells skunks? Q: What body part climbs ladders? Make a clapping sound with your body. Now have children close their eyes. Make one of the sounds with your body that you practiced together. Can the children guess what body part you are using to make the sound. Print the PDF of this activity here. 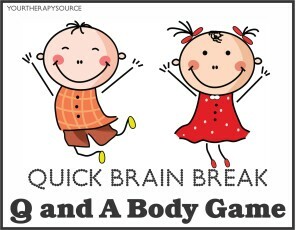 Need brain break ideas? Check out all of our Brain Breaks.